I don't celebrate on the anniversary of someone's birth or death after they are dead. I remember their life, I think about how they touched mine, but don't expect long drawn out posts on it from me. For the longest time he was why I was interested in astronomy, math, physics and yes eventually psychology (Broca's Brain is still a favorite of mine). 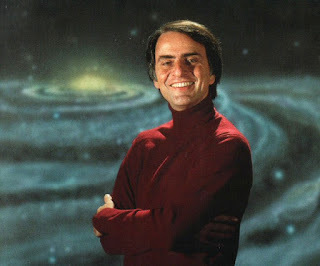 Today is the anniversary of Carl Sagan's birth. I don't say birthday, since obviously he not having anymore. It is also Carl Sagan day. I talked a lot about him back in April, http://freedomofnonbelief.blogspot.com/2012/04/s-is-for-carl-sagan.html, but honestly though I really can't say enough about the guy. I have been tempted to re-read "Demon Haunted World", maybe one of the best books on science (as opposed to a science book) I have ever read. My lament is that he could not have lived longer. His cogent and critical voice would have been much appreciated in the last couple of years. I do take solace though that we still have Neil deGrasse Tyson around.